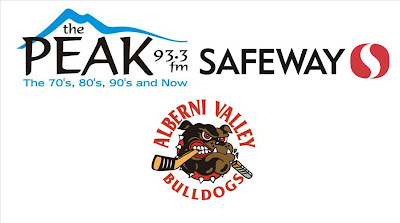 The Dogs are back in action tonight as they host the league-worst Merritt Centennials on Port Alberni Safeway Bulldogs Hockey on 93.3 The Peak FM with the pregame show kicking off at 6:45 and the puck dropping at 7:00pm. Tonight's second intermission feature guest will be former Bulldog Sawyer Eichel. Yes, I haven't posted on the blog since Monday. Please accept my humblest of apologies! I have a good excuse though - I have been working extra hours every day trying to catch up with former Bulldogs still playing the game at a higher level. So far so good, as I've at least made contact with a collection of guys - Sawyer Eichel obviously, Devin Timberlake, Andrew Ella, Jordan Kremyr, Michael Lee Teslak and Brad Gorham. If there's anyone I'm missing, drop me a line and I'll try to find them somewhere out there. No easy task with hockey and school and everything else most guys are dealing with! Any truth to the rumour that the loser of the Cents and 'Dogs will be relegated to Junior 'B' next year?! Hey Chirpy...I'll say the same thing I say to your trainer - 2-1 record against you guys. Don't give me the championship crap either report back to me when you have five rings! So, now we have to keep Merritt for another year!